[T]here is a major problem with these renewable energy sources. Their electrical output is not dispatchable. Their output is entirely unable respond to electricity demand as and when needed. Energy is contributed to the grid in a haphazard manner dependent on the weather, and certainly not necessarily when it is required. For example solar power inevitably varies according to the time of day, the state of the weather and also of course radically with the seasons. Essentially solar power might only work effectively in Southern latitudes and it certainly does not do well in Northern Europe. In Germany the massive commitment to solar energy might well provide up to ~20% of country wide demand for a few hours on some fine summer days either side of noon, but at the time of maximum power demand on winter evenings solar energy input is necessarily nil. Electricity generation from wind turbines is equally fickle, as for example in a week in July this year shown above. Similarly an established high pressure zone with little wind over the whole of Northern Europe is a common occurrence in winter months, that is when electricity demand is likely to be at its highest. Conversely on occasions renewable energy output may be in excess of demand and this has to dumped unproductively. There is still no solution to electrical energy storage on a sufficiently large industrial scale. 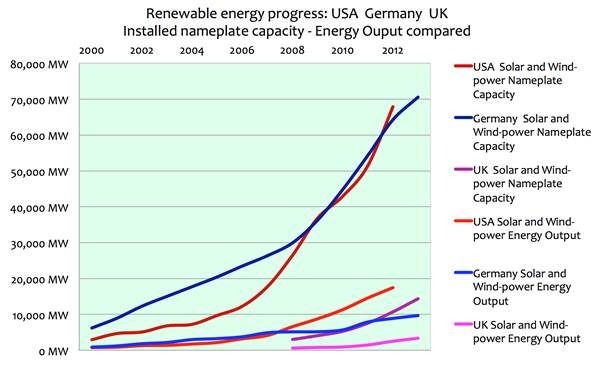 That is the reason that the word “nominally” is used here in relation to the measured outputs from renewable energy sources. Wind and solar power are industries that are destined to remain in their infancy, if not forever, then certainly for the indefinite future.